unHello and welcome to a new month of wonderful new releases and challenges at Our Daily Bread Designs. Our first challenge of the month is a Color Inspiration challenge. This week’s palette is so pretty! I decided to use lilac, teal and soft blue for the challenge combining metallic cardstocks and a delicate polka dot pattern from the Christmas Paper Collection 2014 for my 5″ by 5″ card. 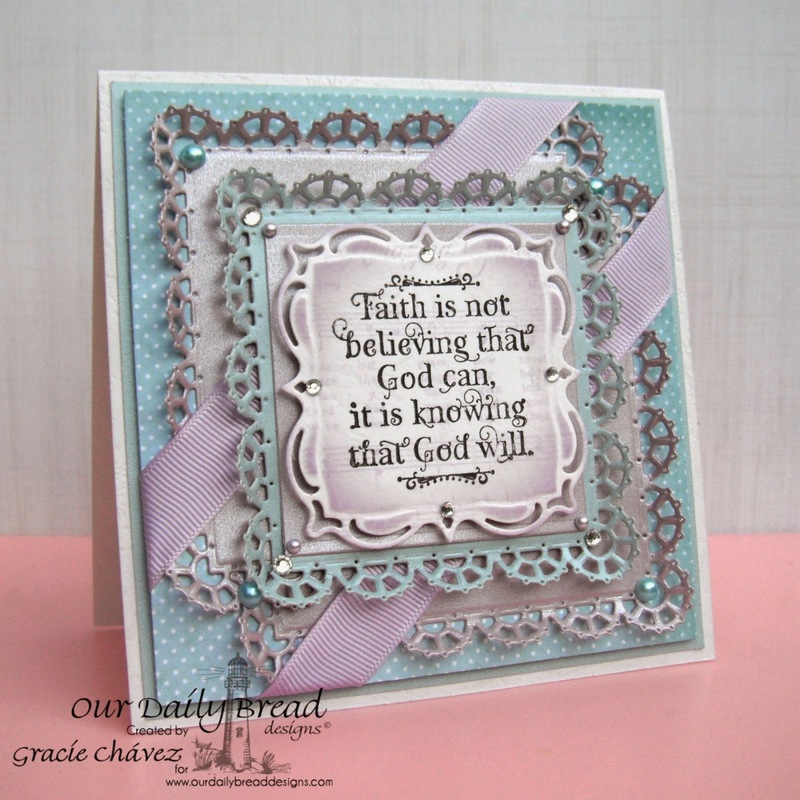 I am excited about the new die sets released this month and today I’m sharing a card I made using the new Layered Lacey Squares Dies. This time I altered the largest square to create a nice frame around the center of the card. I die cut two large squares from lilac cardstock and cut them in a little over a half. I adhered both pieces in diagonal orientation but very close to each other on the center, almost as if creating a larger square with the die cut pieces. Before adding a blue lacey square on the center I added two pieces of ribbon diagonally. Now, the blue square on the center is also altered, but you can certainly skip that step if you want to. 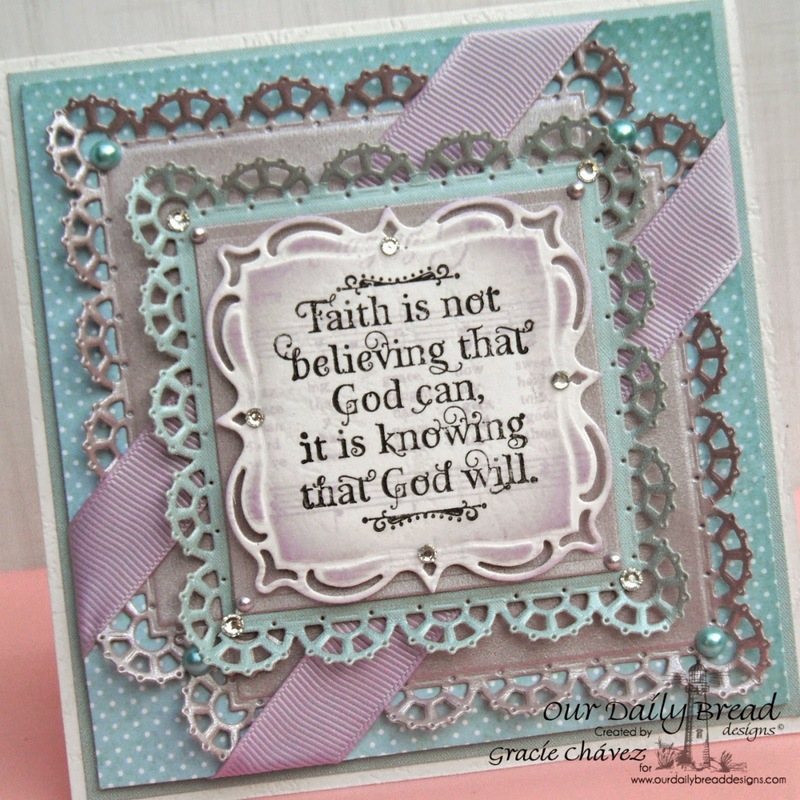 For the central label I stamped first a subtle lilac background using the new Amazing Grace stamp. Then I stamped a sentiment from the recently released God Quotes stamp set in black. Once I stenciled the label I decided I’d add some nice pearls and rhinestones to finish the design. Oh, and I also folded the lace borders inwards to add dimension! I hope you enjoyed today’s post! 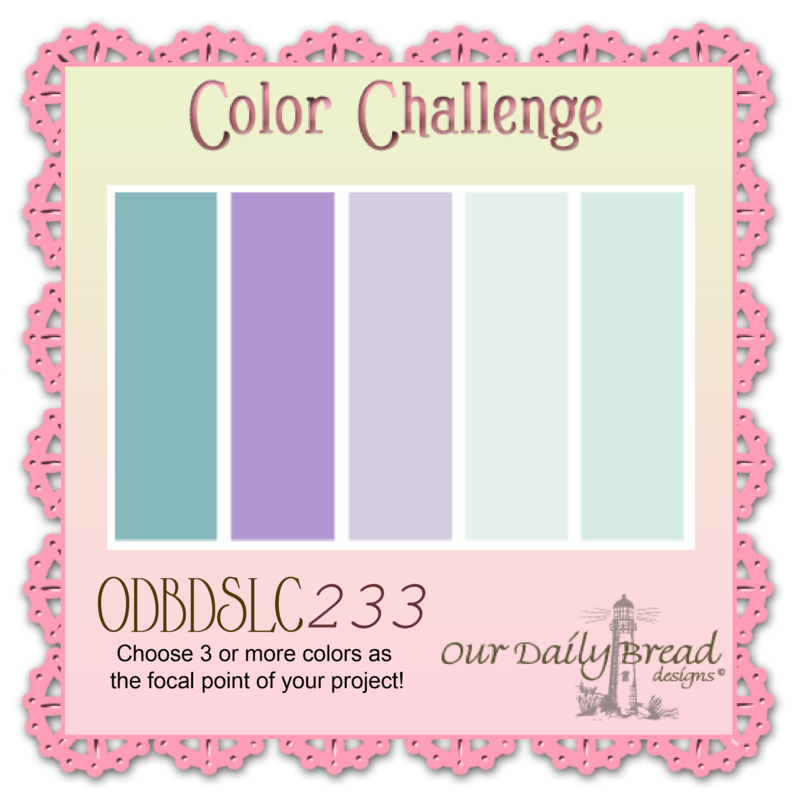 To see all the projects created for ODBDSLC233 or to join the challenge click here. You have until April 12, 2015 at 8:00pm EDT to join us. By participating in the challenge, you have a chance to win a $15 ODBD Gift Certificate good towards the purchase of stamps in the “stamps column” on the ODBD website, or to be spotlighted on the ODBD Blog at our next challenge. The random prize winner will be posted on our next challenge post. I hope you can take a minute to visit my talented teammates and see what they created for the challenge! I know their designs will inspire you! Thanks so much for stopping by! Have a blessed and creative week! What a stunning card! Love the colors and love this quote. Gracie, I just LOVE your card!! Love the lacey squares and I just love the way you put the double ribbon at an angle and between layers!! It looks sooo professional and classy! Wonderful inking and embossing of the elements too! Just gorgeous! Your card is stunning, Gracie!! I just love your offset layering of the layered lacey squares and your angled ribbon!! So lusciously layered!! Gorgeous details and design my friend! Gorgeous card, Gracie! Just love how you've really made these dies shine!! Stunning! And I love this sentiment! Hugs! What a great idea to use the Christmas papers, Gracie! It goes so well with the challenge! Your Lacey squares, pearls and bling are so pretty!!! Your card is so beautiful Gracie! Beautiful ribbon and I love how you used the layered lacey squares dies. Gorgeous! Thank you for joining us by SFC. Stunning card! I love the dimension! Thanks for playing the Lawnscaping Challenge!